Real Patients. A journey to a beautiful smile. Teeth Straightening with Invisalign. What does it mean to you? A beautiful smile using discrete, quick, affordable braces? 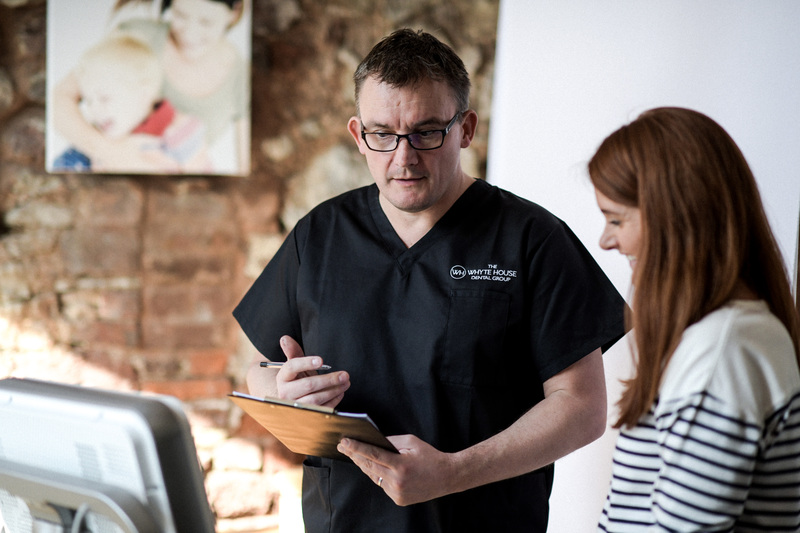 As one of Devon’s leading Invisalign providers, The Whyte House has achieved recognition by being an Invisalign Platinum Provider status recognising the experience of Dr Grant in this discrete orthodontic system. 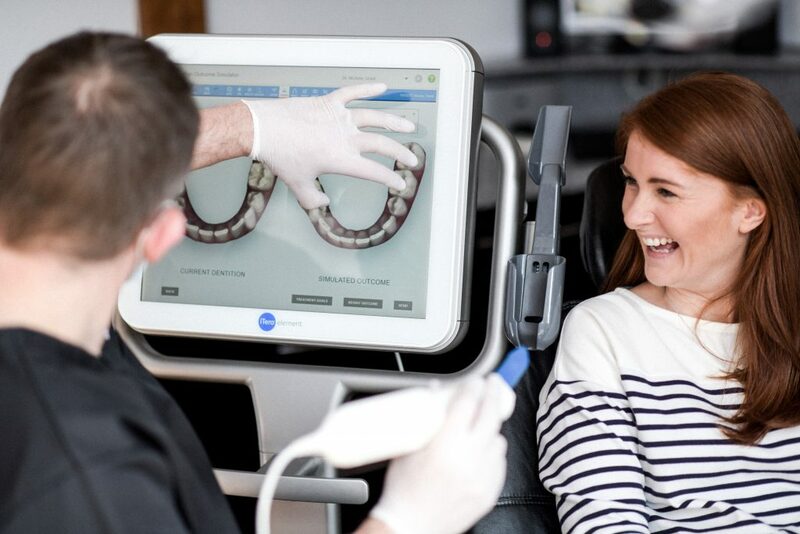 We are a dedicated provider of the no braces Invisalign system, using the latest advances in dental technology to deliver this treatment, giving you the straight teeth and perfect smile you’ve always wanted. 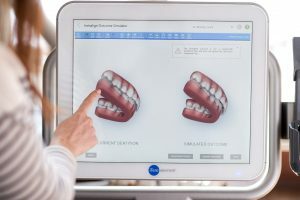 Using advanced 3D computer-imaging technology, Invisalign depicts your complete treatment plan, from the initial position of your teeth to the final desired position. Then a series of clear aligners are custom-made for your teeth – and your teeth only – to move them little by little. Each aligner is worn for 1-2 weeks before being replaced by the next in the series, gradually moving towards the projected final position. Most teeth straightening treatments are between 18 and 36 weeks. We need to carry out a full assessment including your medical history to decide if you are suitable for this treatment. ClearSmile ‘Fixed Ceramic Braces’ straighten upper and/or lower arches using similar technology to traditional metal ‘train track’ orthodontic braces but are less visible because the wires are coated with a tooth-coloured material and the brackets are clear rather than metal. They are permanently fixed, so don’t need to be removed at night or when cleaning your teeth or eating. After a thorough assessment of your teeth and recording of your medical history we can decide if you are suitable for this treatment. The Whyte House Dental Group provide these adult braces with and without extractions depending on the level of crowding you are experiencing. The Inman™ ‘Speed Brace’ is a quick and simple way of straightening your front 4 top or bottom teeth. It’s been dubbed “the greatest innovation in cosmetic dentistry since the porcelain veneer”. Its revolutionary concept can see protruding or crowded teeth transformed, sometimes in a matter of weeks. This brace is more noticeable and more affordable. We offer the full range of adult teeth straightening braces but will need to assess your suitability for this treatment. A free consultation can be arranged and we can discuss your expectations and possible outcomes. Clear Aligners, which look like transparent gum shields, are designed to straighten your front 6 to 8 teeth – with no discomfort or rubbing from metal or bars. 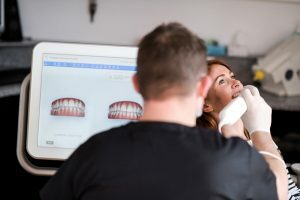 Using exact 3D scan taken by a dentist, Clear Aligners will straighten teeth that are tilted backwards or forwards, or teeth that are crowded or rotated. And because Discrete Clear Aligners are transparent no one may ever know you’re wearing them – unless you tell them! This system is similar to Invisalign. The Clear Aligner system we use at The Whyte House Dental Group is used to straighten just 1 or 2 teeth at a time. A full assessment is required to assess your suitability for this treatment. What is it you don't like about your teeth? Is it your upper teeth, lower teeth or both? Do you want straight teeth for a special occasion? If so when? Patients have their lives transformed by the changes that can be made in as little as 18 weeks. A full assessment is required to determine if you are suitable for these treatments. Please see our full before and after image gallery Photographs. You are also welcome to visit our testimonial page to read what our patients say about us Testimonials. Which Teeth Straightening system is right for you? Devon Teeth Straightening Exeter, part of the Whyte House Group.